Happy New Year! Do you go out on New Year’s Eve or stay home and enjoy a quiet celebration? We prefer to stay home and enjoy some appetizers as we watch the ball drop. 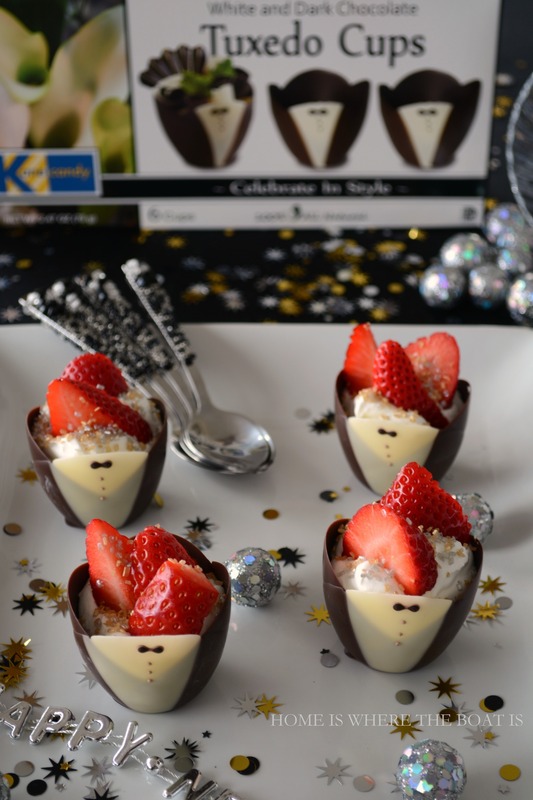 I found Chocolate Tuxedo Cups at World Market, $6.99 for a package of 6 and fun for a festive, sweet bite for New Year’s Eve! These are easy to dress, filling with your favorite ingredients. . . chocolate mousse, berries, whipped cream or even little squares of cake or ice cream. 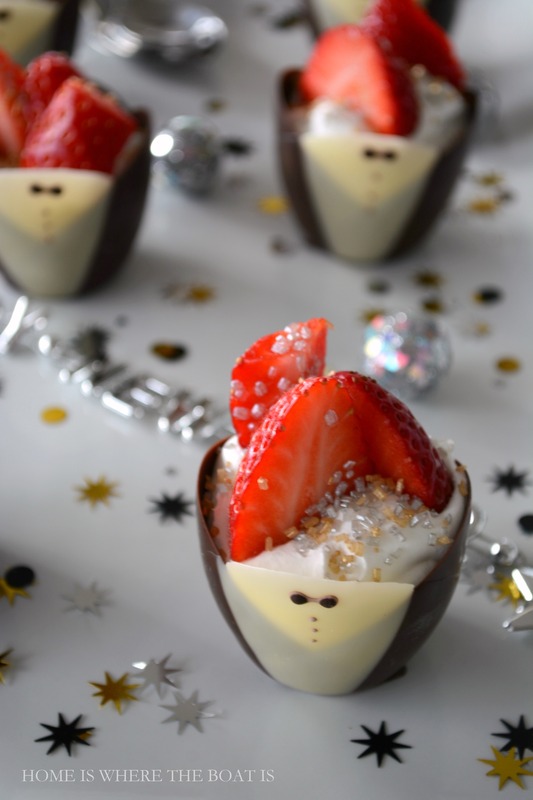 I filled our tuxedo cups with strawberries and Grand Marnier whipped cream. A sprinkle of silver and gold pearlized sugar adds some additional sparkle and bling for New Year’s Eve! You can find glittered or pearlized sugar where baking supplies are sold. I found Wilton gold and silver pearlized sugar at Michaels. To make Grand Marnier whipped cream, mix 1/2 cup heavy cream with 1 teaspoon powdered sugar and 1/2 teaspoon Grand Marnier. Beat all ingredients with a mixer on medium speed just until peaks form. Cream doubles in size when whipped and only takes about 5 minutes to make. It’s best right after you whip it but will hold for a few hours in the refrigerator. 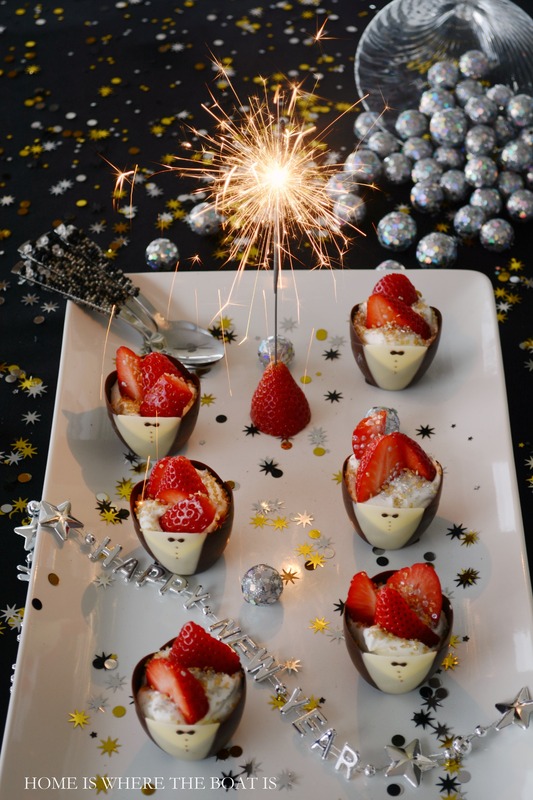 Add a sparkler, light and serve! Wishing you a Sparkling New Year! Wishing you & your sweetie a wonderfully healthy & happy 2015, Mary. I know I say it every year, but thanks for 12 months of delightful inspiration!! What an adorable idea and quick and easy on top of it all. Great way to start the New Year. Wishing a happy and healthy 2015 to everyone. They look great and I bet they taste just as good!! Happy New Year!!! They are so adorable!! They look yummy too! Can’t wait to see what your blog brings for 2015!! Happy New Year!! Festive and edible! Love your attention to detail and always providing us with unique recipes and ideas! From where did you get the white rectangle platter and confetti? Wishing you the best of everything in the New Year! The white platter came from Target several years ago and the confetti from Party City. Happy New Year! Thanks for another beautiful recipe! I look forward to each of your blogs, as they are always so visually appealing and filled with great recipes and inspirations. Thanks for sharing, and I’m looking forward to next year’s posts! Happy New Year, Mary! Oh how festive and beautiful Mary! HAPPY NEW YEAR! ! They are festive & fun!! I love the surprises found at World Market! This is my favorite kind of New Year’s Eve party. Perfect celebration! 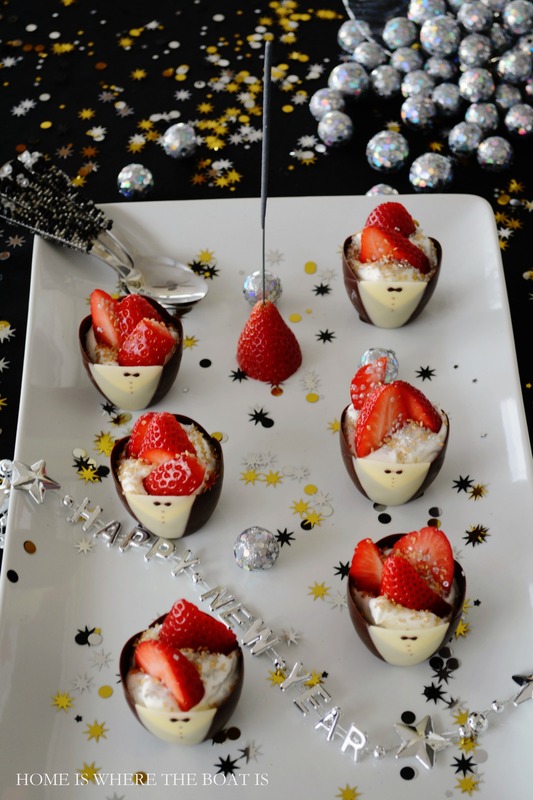 I love the idea of adding the sparkler to serve. Bonne Année 2015, mom ami! I wish I had some chocolate tuxedos to nosh on tonight! 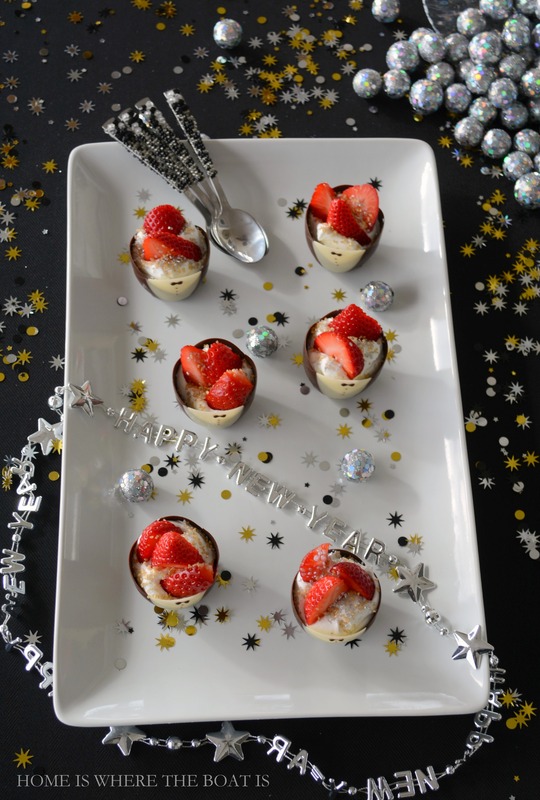 Our plans have changed so many times, I’m not sure what we’re doing…a big bite of chocolate with Grand Marnier whipped cream and strawberries would be just the ticket to soothe my frazzled holiday nerves! I love all your gold, silver and confetti! Have a Sparkling celebration tonight! 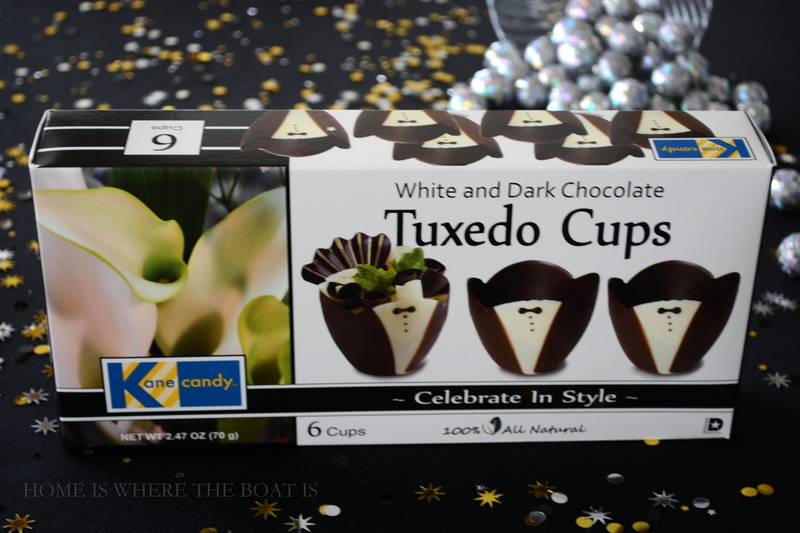 Those tuxedo cups are so adorable!..and of course you make them look so much better with your creations….we also love to spend the evening at home….or for a dinner out with friends . . . Happy New Year Mary…may you have a most happy and healthy one! Happy New Year, Mary! Looking forward already to all of your 2015 postings! Happy Happy New Year to you, Mary. 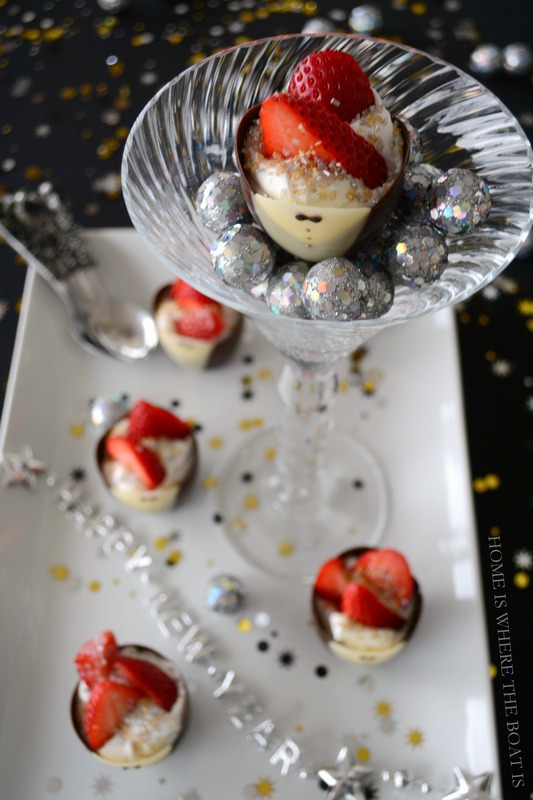 I love your tuxedo cups with strawberries and Grand Marnier cream sprinkled with pearlized and glittered sugar. The sparkle of gold and silver is so festive. Makes me want to have a party tonight but alas it is too late for that. We will have a quiet evening babysitting our grandchildren. Doesn’t World Market have the best little chocolate cups? I’ve not seen the tuxedo ones, bit I’ll be on the lookout for them, Mary. You’ve done them up in such style for NYE!! Happy New Years to you, your hubby and Chloe and Gracie!! Thanks for all the beautiful inspiration you give to all of us. These are adorable and the filling sounds delicious! Happy new Year. These are absolutely gorgeous and adorable for the celebration tonight! These are just adorable! You have the absolute most creative tablescapes all the time. I look forward to seeing everything you do. Best wishes for a happy, healthy, and prosperous 2015. I look forward to following along with your blog. So tonight I would like to raise a toast to you Mary, and thank you for sharing your amazing talent, and inspiring all of us like you do!! CHEERS!!!! How cute and festive! Thanks Mary. Happy New Year!! Mary, those are absolutely adorable! These would be the perfect party food or food to eat on one of those days when you just need something fun to make you smile. Thanks for sharing with us. very cute, almost worth staying up for! says the one fast asleep by 8:30! when you wake around 3:30 am the nights are very very short! Mary, I love your presentations—adding the sparkler shows your attention to detail, and gets my thinker going for table settings I can create. 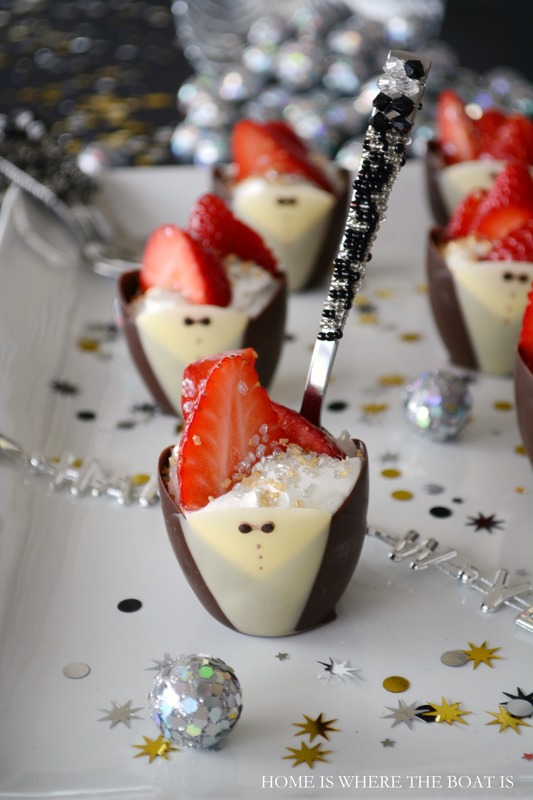 The tuxedo cups will be on my menu next NYE!